Sat 31.03 at 14 and Sun 31.03 at 13 in bridge of Estonian National Museum (Muuseumi tee 2, Tartu, Estonia), important guests Petri Juutilainen (FIN), New Wind Jazz Orchestra and Raul Sööt (EST), JVLMA & RDKS Big Band (LAT). Sat 05.05 at 14 and Sun 06.05 at 13 in bridge of Estonian National Museum (Muuseumi tee 2, Tartu, Estonia), international guests Jukka Linkola (FIN), Jelgava Big Band, conductor Raitis Asmanis and vocal soloist Aija Vitolina (LAT), Bobby Chavez, Larry Gillespie and Konstantin Jemeljanov (Los Angeles Mambo All-Star Orchestra, USA). Thu 20.04. at 19, Sat 22.04. at 16 & 19 in Tartus, Eller Music School Tubin Hall, Sat 22.04 at 16 on Stage of Supilinna päevad, international guests Finnair Pilots Big Band (FIN), Valmiera Big Band (LAT) and conductor Raitis Asmanis (LAT). Big Band Tartu will participate in 20nd International Big Band Competition in Hoofddorp, Netherland, which will be organized by Corendon Meer Jazz Festival (meerjazz.nl). 14.-15.02. and 17.-19.04.2015 Finnish trombonist, composer and conductor Antti Rissanen is visiting Tartu and working with Big Band Tartu. The result of the work will be seen on concert on Sunday 19.04.2014 in new Tubin hall of Tartu Eller Music School. On Saturday 10.01.2015 Big Band Tartu participated in Jazz Concert of 24th Winter Music Festival Valmiera. 18.-19.01. and 04.-06.04.2014 Finnish trombonist, composer and conductor Petri Juutilainen is visiting Tartu and working with Big Band Tartu. The result of the work will be seen on concert on Sunday 06.04.2014 at 4pm in Tartu New Theatre. Jazz-performance in Vanemuine Theatre, Tartu, Estonia. Premiere at 22.09.2012, nineteen performances in season 2012/2013. ...is performing again. See whats happen, if Tartu Sax Choir, Tartu 1st Music School Clarinet Choir and Tartu Frenchhorn Choir playing together. From 16 to 18 of March 2012 Big Band Tartu participated on 16th International Big Band Workshop in Neubrandenburg (Germany) and had change to have lessons with very good musicians. 14-16.10.2011 May Peters (Holland/Puerto-Rico) - a jazz-trombonist and specialist of Caribbean music will work in Tartu with local musicians. 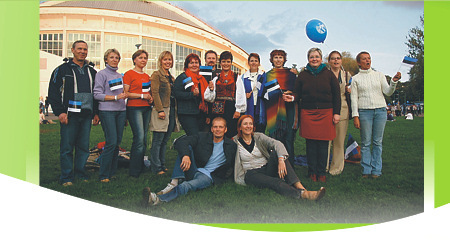 Masterclasses will culminate on concert in Tartu Harbour Theatre on Sunday 16.10.2011 at 16. Both collectives will give 2 concerts in Kaunas Hanseatic Days with program of 15.-17.century music. World famous Euphonium virtuoso Steven Mead will visit Estonia in March 24-28, 2010. On 26th of March at 19 he will give a concert in Ministry of Education and Science (Munga 18, Tartu) with Big Band Tartu and Orchestra of Estonian Defence Forces. On 26.-30 of August 2009 organized Bert Langeler together with citizens of Zaltbommel (Holland) and with Estonian konsul in Zwolle, mr. Nicolaas Anthony van der Grientt a wonderful "Estonian festival in Holland".